You can almost see the sap rising – gushing forth in fact to catch up after a slow-start spring. Anyway, walking amongst it this morning made the pursuit of allotment chores a complete and utter pleasure. The chore in question is part of my on-going experiments with no-dig cultivation. So armed with my big green polypropylene bag I was out gathering up some of the piles of tree shreddings left around the Linden Field by the chap who comes to trim the lime trees’ overgrowth. I then haul them up to the allotment where I am covering a 6 feet wide x 20 feet section of uncleared plot with cardboard plus several inches of chippings on top. It’s rather a slow process, but I’m over half way there. I’m hoping that by the time I get round to cultivating this section next year, most of the worst weeds will have turned up their roots, and the mulch rotted down enough to produce a reasonable planting medium. Oh yes, and that in order to achieve all this both the cardboard and the mulch will have attracted a lot of very happy worms. And then at the end of the avenue near one of my target chippings piles, I noticed a nice flat area between the limes and the old railway line. I had not spotted it before, but it looked just the place for some qi gong. Secluded enough, I thought, not to frighten any of the Wenlock dog walkers who might otherwise come upon me in the midst of repulsing the monkey or being a wild goose flying. 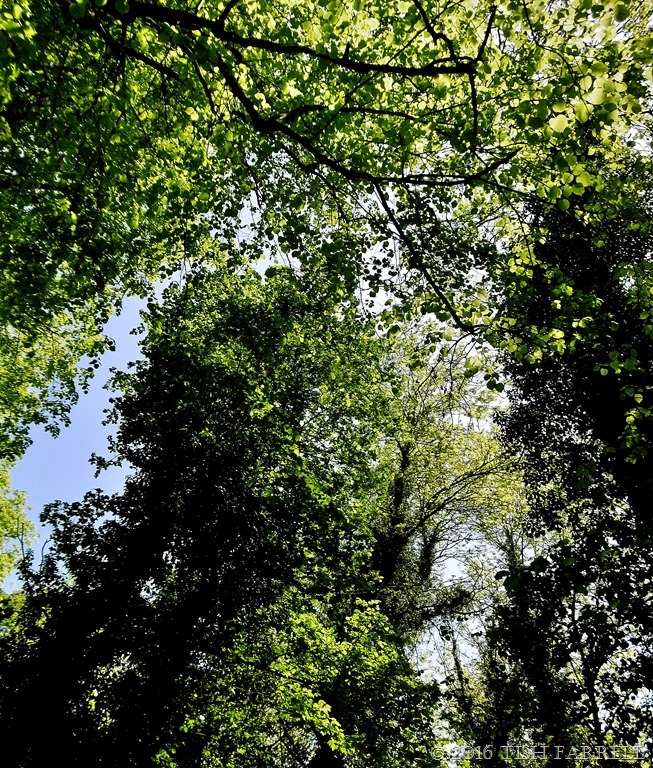 So this is where I stood – beneath a canopy of limes and sycamores, accompanied by bird call and the soft flutter of pigeon wings. Aaaaah. Wishing you a similarly blissful, green-filled, sap-rising, sun-dappled day. Now please pop over to Jo’s Monday Walk for a truly inspiring excursion in beautiful rural Poland. And to add your own walks to Jo’s go HERE. In case you don’t know Meg she is presently in Warsaw, and if you want to get in lots of vicarious walking with fascinating things to see (and sometimes eat) please join her there. Anyway, this wild orchid is for her, and so is this walk, since it took me back to Windmill Hill (which is actually only across the road from my house), to search once more for signs of spring. At least last Friday the sun was out, but we still have a continuous chilling wind. As I may have said elsewhere, it feels as if it has blown across an ice sheet before ending up in Shropshire. Brrr. So far it looks as though ‘clouts’ will not be cast in June, never mind in May. I, for one, am sticking to my many garment layers, which may or may not include a vest. But back to the orchids. This one took some finding, but I had promised Meg I would look. 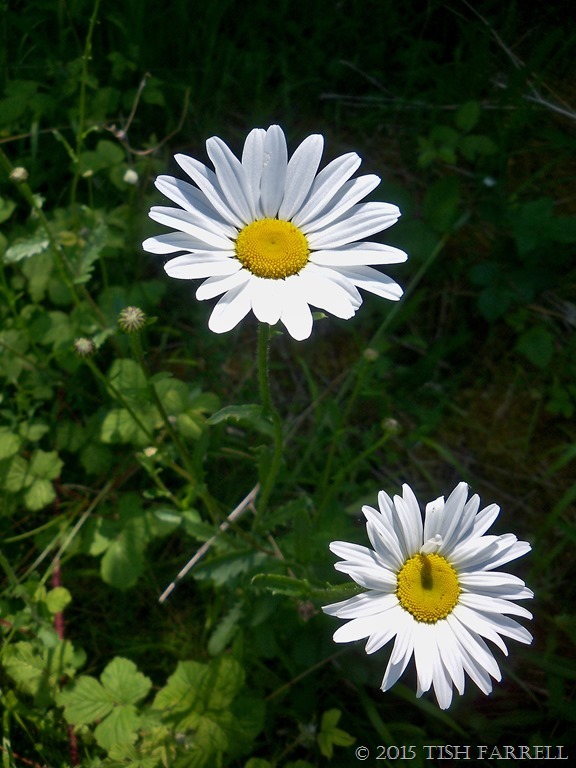 She had read my mention of limestone-meadow plants in an earlier post about Windmill Hill, and wanted to see more. 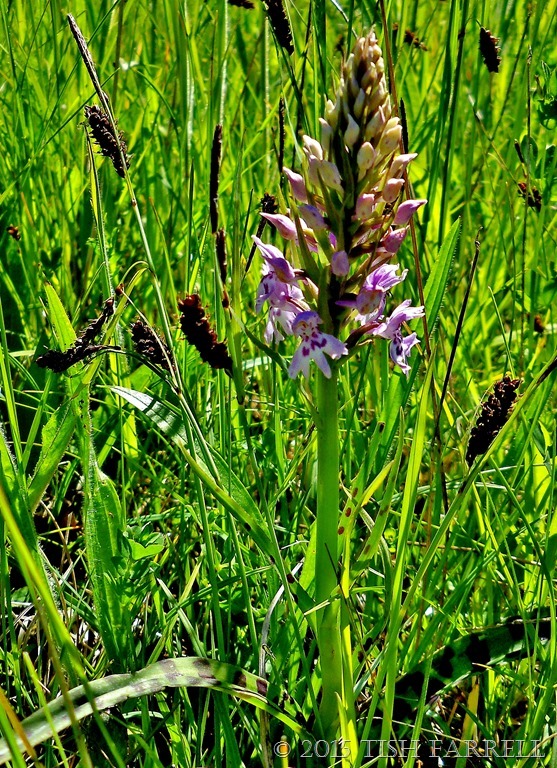 This lovely little plant, about a hand’s span tall, has the plain name of Common spotted orchid. 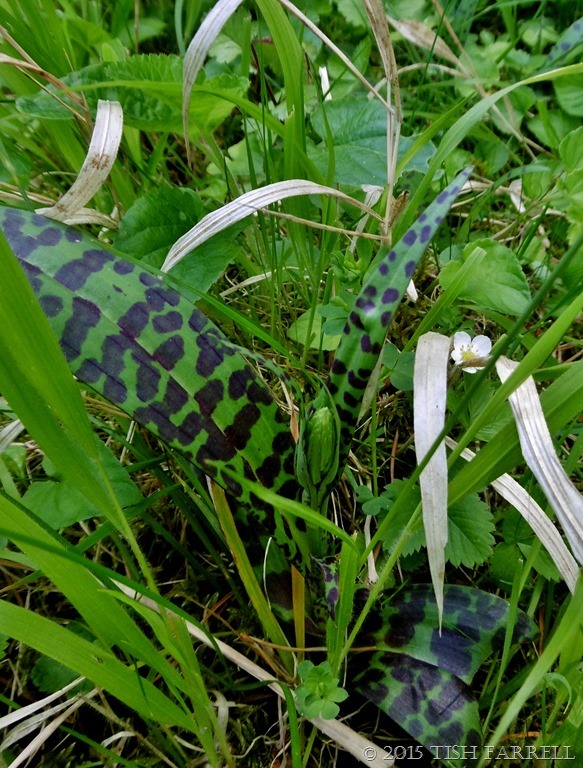 It was growing at the foot of the hill, and I had seen the darkly spotted leaves a week or so before. They are definitely being slow to flower this year. They probably don’t like the wind either. To find them I went the long way round, once more up the Linden Walk whose ancient limes are now bursting into juicy green clouds. Soon (I hope) they will be flowering, and then I can get high on the scent, as well as on the sight of them. 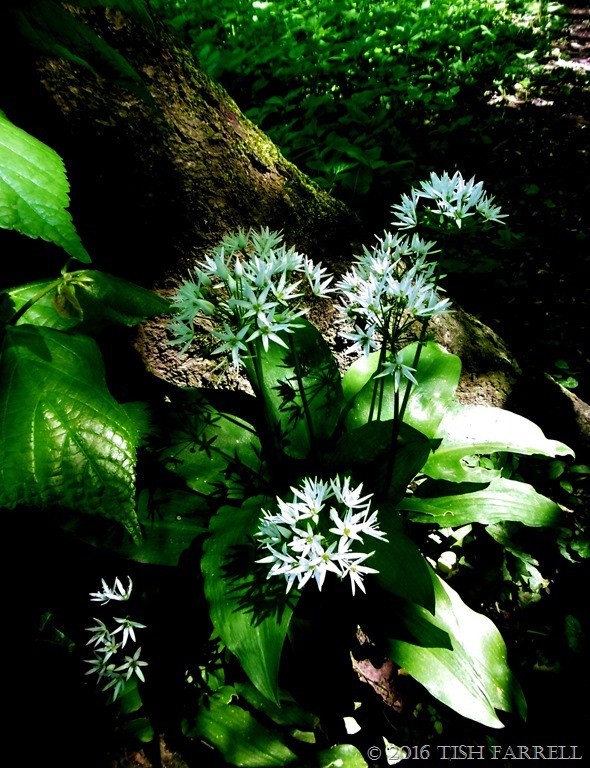 (Herbalists use lime flowers as a sedative, quite a strong one, so don’t use the flowers without expert guidance). 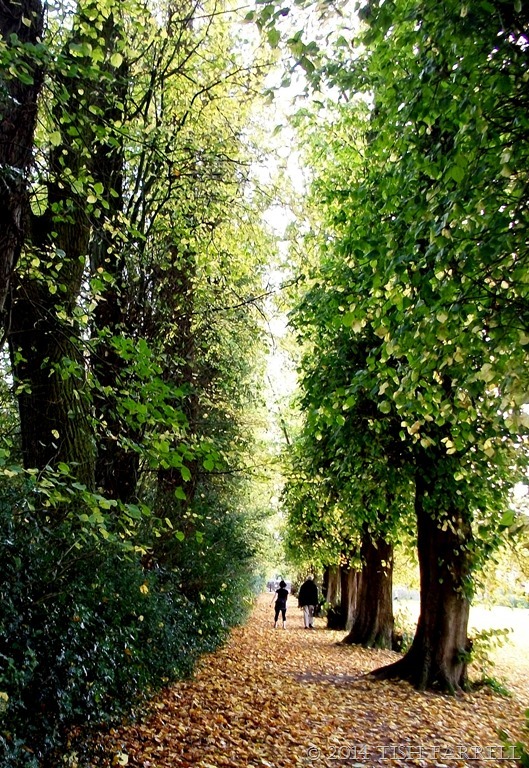 Good old Dr. William Penny Brookes, Much Wenlock’s erstwhile physician, and the man who planted this avenue over a hundred years ago, knew what he was at on the life-enhancing front. Bravo Dr. Brookes. 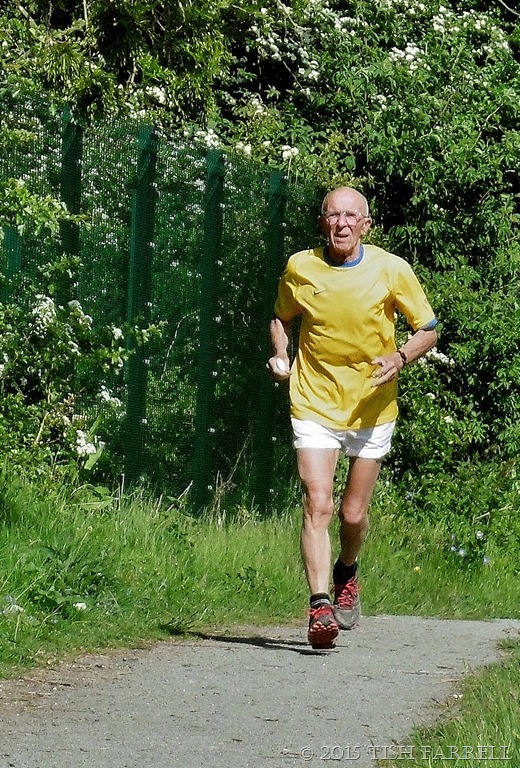 Once out of the Linden Field and onto the hill, I’m taking the low path around the bottom when along comes octogenarian, Jimmy Moore, our local marathon man. He’s out on his morning run – an example to us all. He’s raised over £30,000 for charity. Seeing him approach in his buttercup yellow shirt is enough to lift the spirits sky-high. Keep on running, Jimmy. As he passes me, he still has breath to crack a joke, and to say my photo of him will doubltless be worth a fortune. He speeds away, and I meander on, peering into the meadow grass. 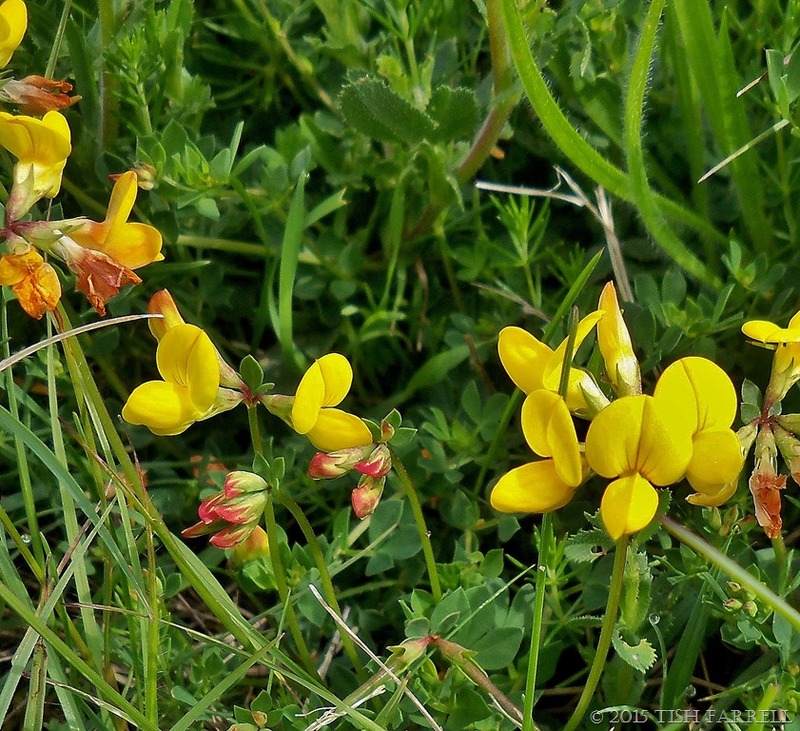 The cowslips are over, but there are low growing clumps of Common bird’s foot trefoil, Lotus corniculatus if I am not mistaken in my identification from the classic Keble Martin work on British flora. As you can see from its pea-like flowers, it belongs to the legume family. The search for orchids next takes me along the hedge line where the open meadow becomes woodland. And here I find the first elderflowers of the year. I love their creamy colours, and they make the most delicious sorbet (recipe at the end). The flowers also make a fragrant tea that is anti-catarrhal, and when mixed with peppermint is a good remedy for colds and flu. The elder tree itself has magical connotations, and features in many traditions of indigenous peoples around the world, including North America’s First Nations’ tales. The dark purple berries are of course now used in a commonly available anti-viral that goes under various names that derive from its botanical name Sambucus. The berries’ efficacy was trialled some years ago by Israeli scientists, if I remember rightly, and used to treat HIV- patients. They are thus, not by any means, ‘a quack cure’. 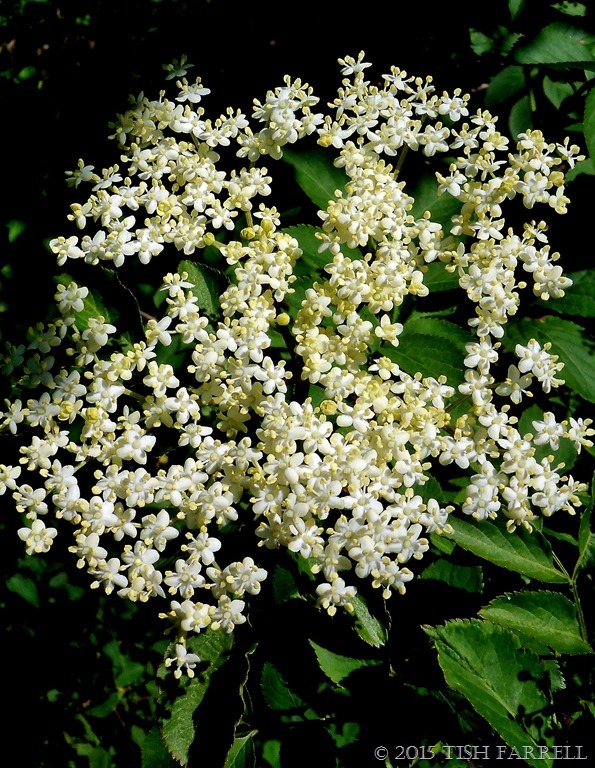 First pick the elderflowers when they are freshly open , and on a dry day. Shake out the bugs but do not wash. Keep the heads intact. Pare the rind finely from the lemons, and squeeze out the juice. Heat the water and sugar in a pan, starting gently until the sugar has dissolved, add the lemon rind and then boil briskly for 5 minutes. Remove from the heat. Add lemon juice and elderflower heads. Leave to cool. Strain into a suitable container and freeze. After an hour or so, when the sorbet is slushy and starting to set , you can give it a good mash with a fork to break up any crystals, and return it to the freezer. Alternatively, strain and churn in an ice cream maker. This sorbet is delicious with fresh strawberries. And guess what, as I finish writing this post the wind has dropped, and it is suddenly HOT. Just the weather for sorbet. Hurrah! P.S. It didn’t last, so we had broad bean soup instead. Please do drop in on Jo’s Monday Walk and Meg’s Warsaw2015 if you are up for some more interesting excursions. For a small community a lot goes on in Much Wenlock. 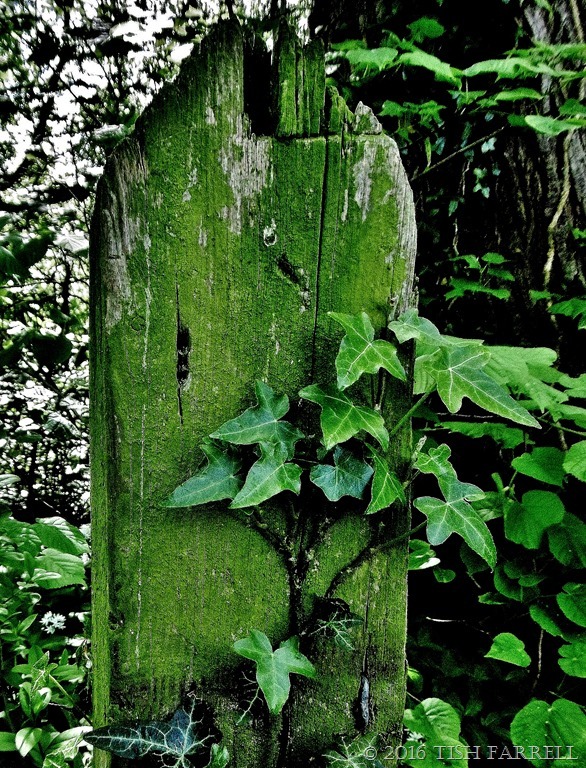 In fact you never do know what you will find even a stone’s throw from the doorstep. 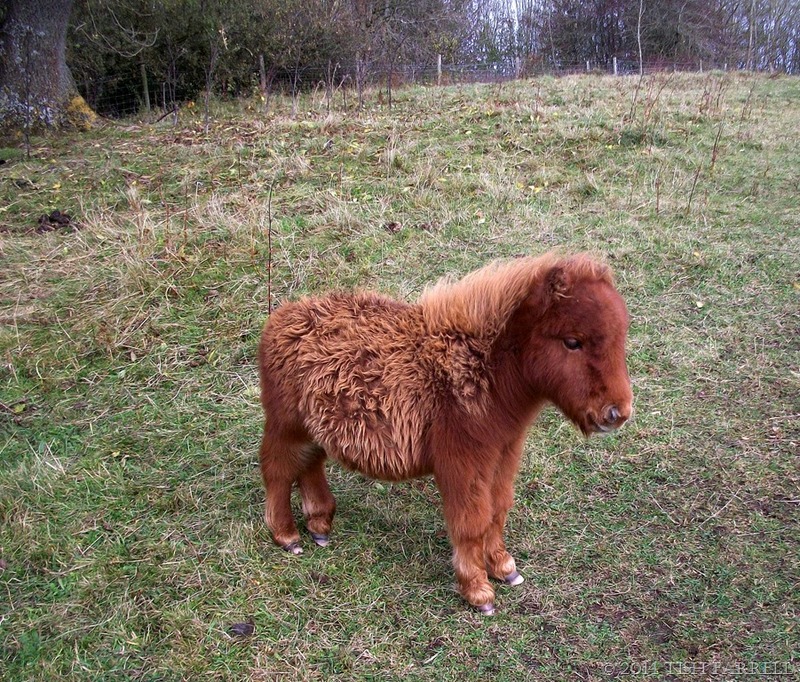 So it was that on a recent foray up Wenlock’s Windmill Hill, and for quite another purpose, G and I met up with this astonishing little horse. Given its newness on the planet, I was impressed by its air of stolid self-containment. It did not move an inch as I walked around it snapping photos. I asked it a few questions of course, but it seemed lost in thought. 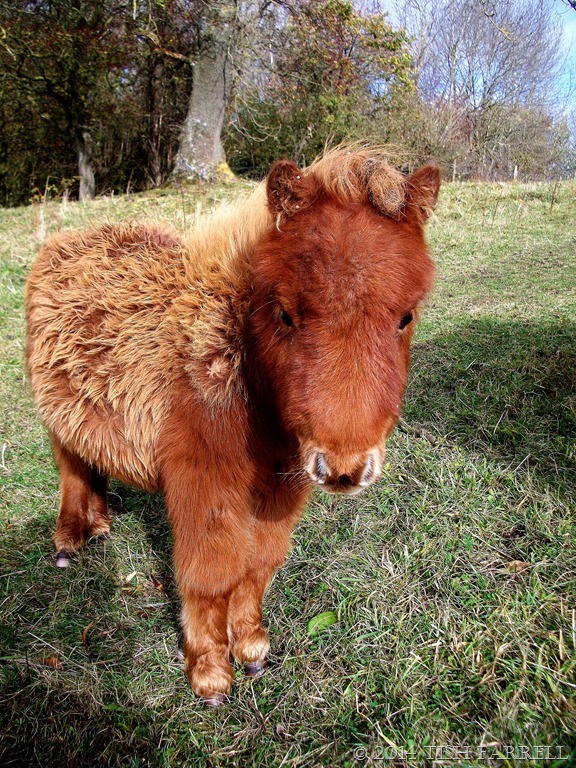 I even felt it might be having an identity crisis: I am a real little horse, aren’t I? Or am I? Then at last it reached a happy horsey conclusion and went off to do a bit of grazing with the other little ponies. But please do not ask about the man in the next photo. He has the most irritating habit of walking into my shots. Does anyone else have a man who does this? Here, though, he is perhaps adding some sense of scale, a factor drilled into me as important during my student-archaeologist days. 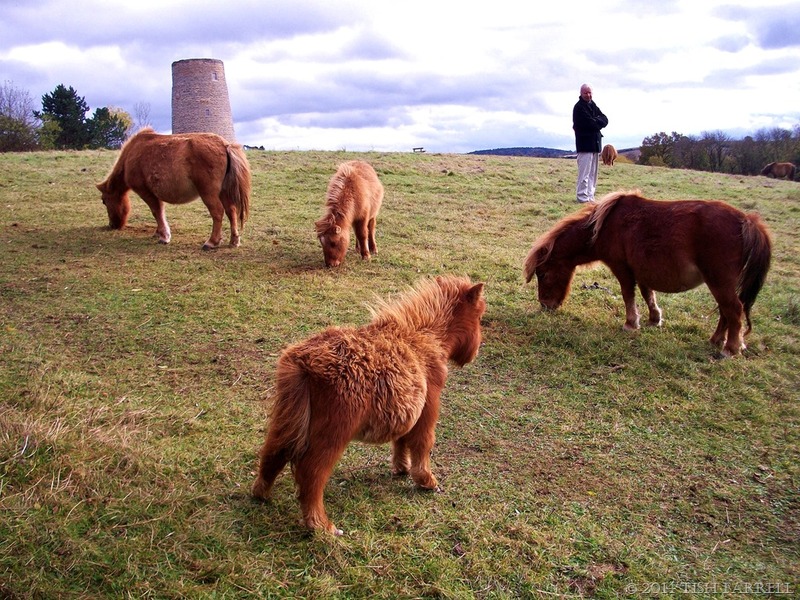 And archaeology, not little ponies, was the real reason for this outing to Windmill Hill. 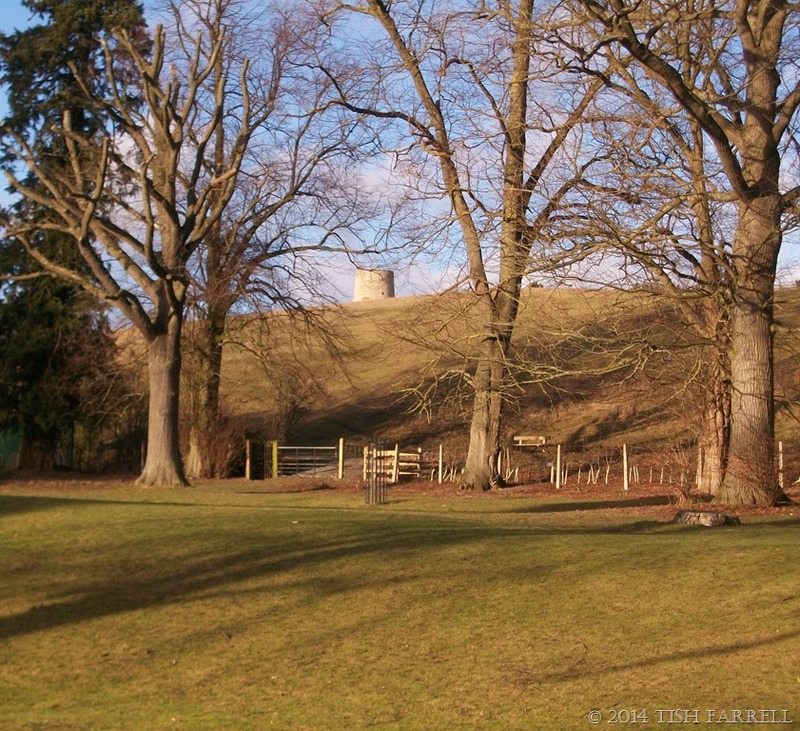 In the background you can see the limestone tower that gives the hill its name. 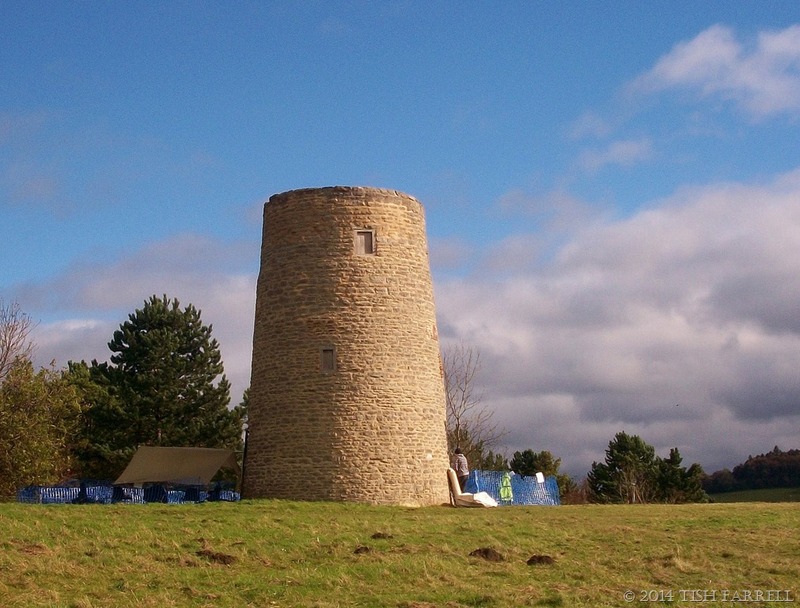 It is a famous local landmark, and only a short walk from our house. In its time, it has been both a watch tower and a windmill. 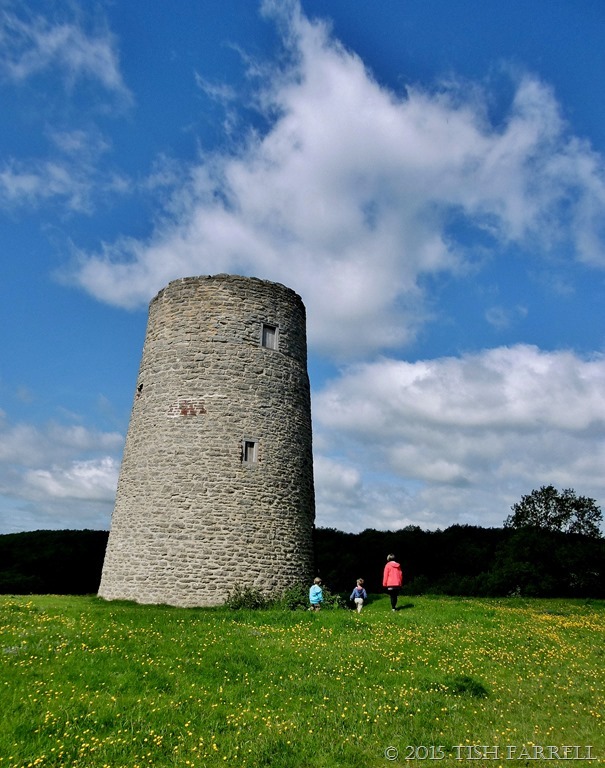 Carved stones from its interior suggest construction dates of 1655-57, but none of the members of the Windmill Trust, the volunteers who look after the monument, has been able to discover quite what the mill would have looked like during its working life. On the day of our visit a small archaeological dig was taking place beside it to investigate the possibilities of earlier human activity on the site. We went to see how the diggers were getting on, but disappointingly they said they had not found much that was particularly old. There were broken clay pipe stems of course– a feature wherever you turn a spadeful of earth around the town. Clay pipes were an important manufactured product here in the 17th century, and clearly used extensively by the locals as well as being exported. 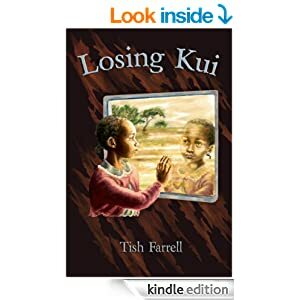 On finding there had been no great discoveries, we wandered off across the hill. In early and late summer the pasture here is covered in wild flowers typical of a limestone meadow – orchids, cowslips, agrimony, wild thyme, St. John’s Wort, knapweed, drifts of yellow Lady’s Bedstraw, but now the grassland has a tired look, though clearly tasty enough for the ponies. We scanned the fields all round. Recent lidar remote sensing surveys have revealed the existence of extensive mediaeval remains a few fields away from the windmill, and also the possible outline of a Roman villa. In any event, there would have been much human activity in the area from at least 680 AD when Milburga, the daughter of the Mercian king, Merewahl, became abbess of Much Wenlock Abbey. Her land possessions were extensive. She also later became a saint, renowned for all manner of odd miracles. 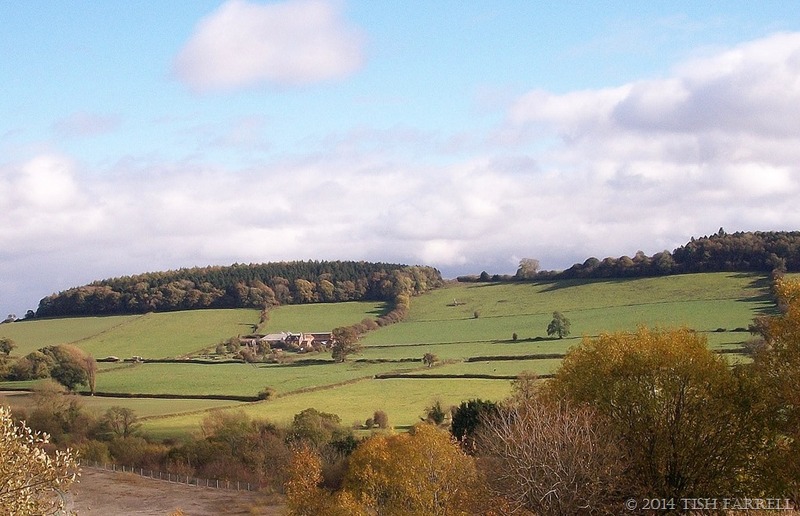 But great antiquity apart, the views from the hilltop reveal everyone’s idea of a typical English farming landscape, although it does not come without its adjacent ‘blot’. The ground immediately behind the hill falls away into a bleakly huge quarry with a deep pool of strangely turquoise water. 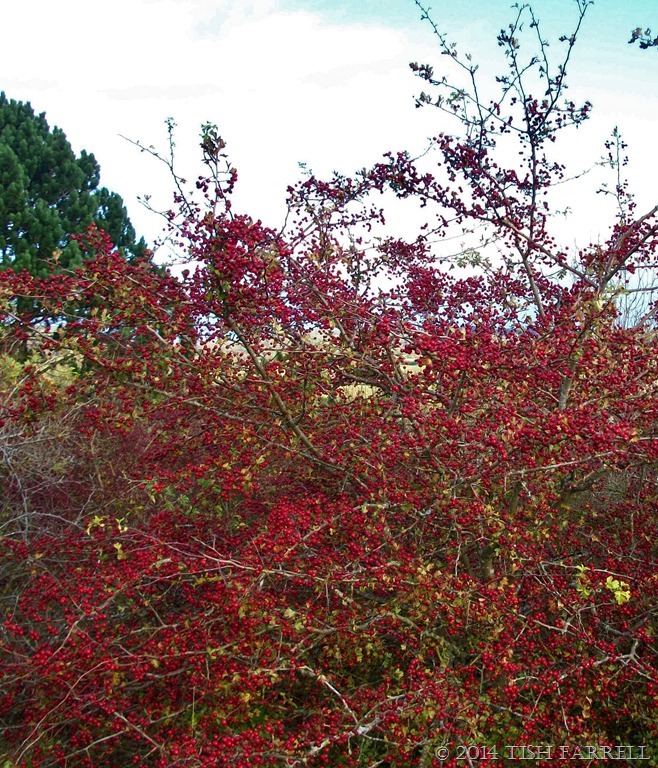 Now disused, the workings are screened by conifers, and also by this astonishing display of hawthorn berries. Plans to turn the site into a diving school with log cabins seem to have to been dropped. At the foot of Windmill Hill is the Gaskell Recreation Ground, or Linden Field. Having long been used for village cricket and bowls, it was bequeathed to the people of Much Wenlock in the 1930s by a descendent of the Gaskell family who owned much of Milburga’s former domain. It was here too, from 1850 that the first modern Olympian Games took place every year, attracting athletes from across the country. The man responsible for reviving this prestigious sporting event was the town’s local doctor, William Penny Brookes. Every year, thousands of visitors would come to watch the games, arriving on the Olympian Special train. The station was conveniently situated beside the field, the bringing of the railway being another of Penny Brookes’ successful projects for the benefit of Much Wenlock. The field was bare of trees in those days, so spectators could sit on Windmill Hill, amphitheatre-style, and have a fine view of track and field events. The Much Wenlock Olympian Games still take place on the Linden Field every July, and attract sportsmen and women from around the world. The Olympic Association also acknowledged Much Wenlock’s contribution to the modern movement with the naming of the Wenlock Mascot in the 2012 games. But now here we are heading homewards, taking the path that runs down edge of the Linden Field, and beside the old railway line. Here William Penny Brookes left another legacy. 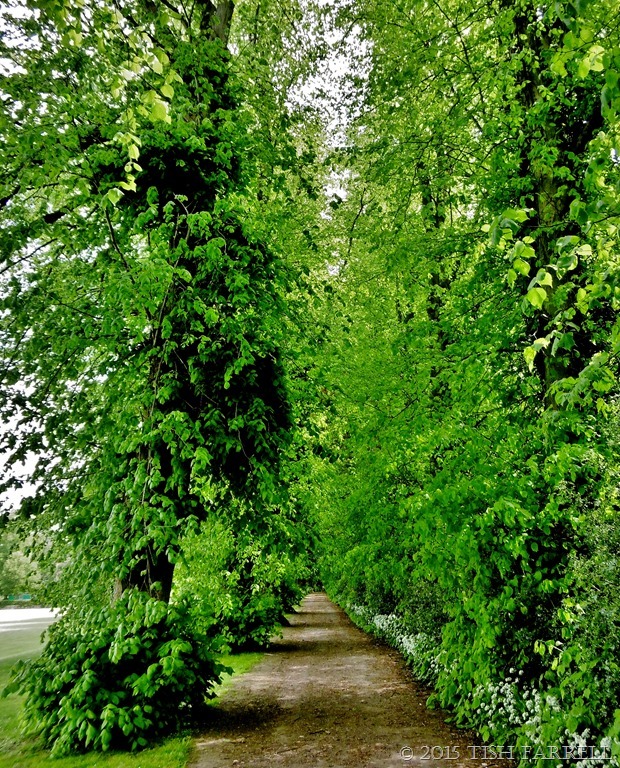 He planted an avenue of lime trees – the Linden Walk. Many of the trees are around 150 years old and still going strong. 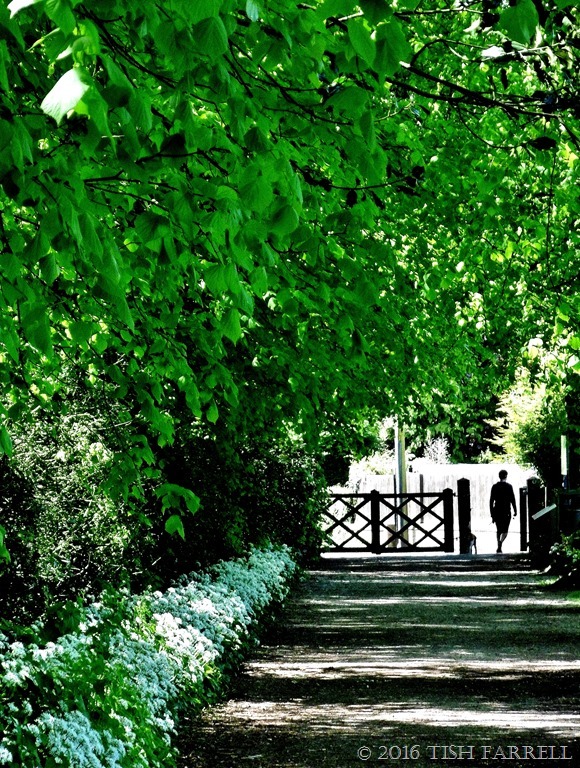 The scent of the blossom in summer is transporting, but the walk is beautiful any time of the year. It is one of the town’s many treasures, and accessible to all. As I stopped to take this photo, a young woman went powering past me, clearly in training for some event. But as you can see, that man is also there again. It is a puzzling phenomenon – how he is ever in my sights.